Specially formulated to provide a convenient source of fuel perfect for pre-, during and post-event fuelling. 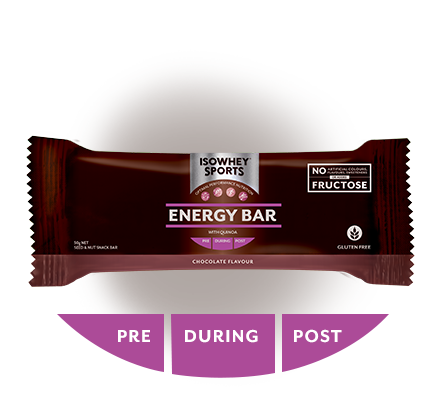 Energy Bars can be consumed before an event as a part of a carbohydrate loading strategy and to ensure sufficient levels of muscle and liver glycogen, during an event to stabilise blood sugar levels and provide ongoing fuel, or after an event to replace expended nutrients and to maximise recovery. They provide a combination of both simple and complex carbohydrates. Simple carbohydrates enable the rapid replenishment of glucose directly and quickly into the blood stream, whilst complex carbohydrate sources provide support to working muscles over a longer period of time. Full of wholefoods, nuts, seeds and ancient grains, and without artificial chemicals, flavours or preservatives that can contribute to digestive discomfort and hinder performance. Contains antioxidants sources from goji, cocoa, chia and cranberries as well as trace vitamins and minerals. For pre-game carbohydrate loading, mid-session fuelling for endurance events or post-game recovery optimisation. 1 serving (50g) IsoWhey Sports Energy Bar is useful before, during or after sustained strenuous exercise. Brown rice syrup, whey protein concentrate, almonds, dates, quinoa flakes (6%), cocoa nibs (6%), cocoa powder (4%), sunflower seeds, pepitas, chia seeds, puffed amaranth, natural flavour, salt, antioxidant (mixed tocopherols). Contains milk and tree nuts. Made on equipment which processes peanuts and sesame, therefore these allergens may be present.